New DIET Menu for KGBVs, TS Model Schools, TSREIS Institutions (Day wise DIET Menu): DIET Menu for KGBVs, TS Model Schools, TSREIS Institutions, TS Social Welfare Schools DIET Menu, TS Tribal Welfare Schools DIET Menu, TS BC Welfare Schools DIET Menu, TS Minorities Welfare Schools DIET Menu, TS Model Schools Girls Hostels DIET Menu, TSWREIS DIET Menu, TTWREIS DIET Menu, TMREIS DIET Menu, TSBCWREIS DIET Menu, KGBVs DIET Menu. DSE Telangana, Rc.No.3232, Dated: 27-12-2017 :: Sub: Telangana SSA, Hyderabad - KGBVs - Revised Common Menu for Kasturba Gandhi Balika Vidyalaya Schools, Model Schools Girls Hostels/ TSREIS to be implemented w.e.f., 1s1 January 2018 onwards - Communicated - Reg. Ref: C & DSE & EC, SPD, SSA Proc.RC.No.353/SSA/T9/KGBV/2015 dt.14.03.2017. It has been decided to implement a revised common menu Kasturba Gandhi Balika Vidyalaya Schools, Model Schools Girls Hostels/ TSREIS w.e.f., 1st January 2018 onwards. In view of the above while communicating revised common menu to the Secretary TSREIS, Addl. Director, RMSA (Mod el Schools) and all the DEOs & E.O. 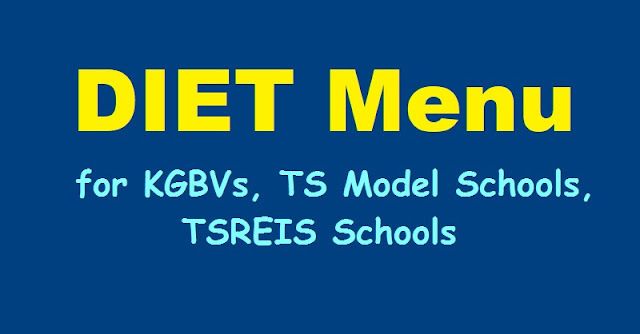 POs, TSSA in the State to instruct the Principals of Model Schools/ TSREIS and Special Officers of KGBVs (except Hyderabad & Medchal) to implement the revised common menu and display the flexies in conspicuous place in the Schools /Hostels and see that it should be implemented without any deviation. Receipt of the proceedings should be acknowledged. TREIS :: Rc No. 2755, Date: 29.12.2017 :: Sub: TREIS-Revised Diet Menu for Implementation in TREIS Institutions- Orders issued- Reg. Vide reference 2nd cited, TREI Society has circulated the DIET Menu for implementation in all Institutions. Vide reference1st cited, the Director of School Education has issued Orders with revised common DEIT Menu for implementation from 01.01.2018 in all TREIS Institutions, KGBVs and Model Schools. In view of the, following common DIET Menu is hereby circulated to all TRE Institutions for implementation from 01.01.2018. 1. KGBV Schools, per capita is Rs.33.33 per head per day. 2. For all TREI Institutions, DIET Charges are permissible as per the rates approved in the G.O.Ms.No.34, Scheduled Caste Development (Education) Department, Dt:23.05.2017. Hence the Quantities may be increased accordingly in TRE Institutions. 3. Egg should be provided on 4 days and Fruit should be provided in 6 days Chicken Curry should be provided on 1st & 3rd Sunday (Lunch) and Mutton curry should be provided on 2nd & 4th Sunday (Lunch). 4. Chicken curry should be provided on 2nd and 4th Wednesday (Dinner). 5. In case of 5 Sundays in a month, then Chicken curry to be provided on 5th Sunday for Lunch. Chicken curry on 4th Wednesday (dinner) is to be replaced with Vegetable curry. 6. Vijaya Brand Ground nut Oil or Rice bran oil or Refined Sun Flower oil should be used for cooking. 7. Fruit may be given at the time of evening snacks or during dinner. 8. Use fortified salt only. 9. All food items must and should have FSSAI (Food Safety and Standards Authority of India) certification. 10. Each child should receive at least 150 ml of milk in a day. 40 ml in the morning with ragimalt/boost, 35 ml in the form of curd/buttermilk at lunch and 40 ml in evening Tea and 35 ml in the form of curd/buttermilk at dinner. Buy packaged milk only from Vijaya or other such standard Dairies. 11. Ragi porridge can be served with milk or buttermilk as per the wish of the children. The quantity should be 40ml milk. 10gm ragimalt. 10 gm Jaggery. On the days when Boost/Horlicks/Bournvita is served this should be 3 gms along with 40ml milk. 12. When puri/idli is served, each child should receive 4 pieces each. 13. When chapathi is served, each child should receive 2 pieces (standard size) each. 14. Each child should receive at least 200gms of vegetables perday in different forms in the proportion of 50g leafy vegetables + 50 gm other vegetables at lunch and 100gm of other vegetables at dinner and 50gms tubers. 15. Each child should receive at least 500gm of rice in a day – each serving should be not less than 200gms. 16. On the days that chicken is served, each child should receive at least 100gms of chicken. The chicken procured should be skinless and cleaned well – wash at least 4 times with turmeric. 17. On the days that mutton is served, each child should receive at least 40 gms of mutton. 18. In the case of accompaniments such as chutney, chole, etc., each child should receive at least 25 gms. 19. Pongal/Kichidi should have cereal and Dal in proportion of 3:1.A few vegetables can also be added. 20. At least 4-5 varieties of leafy vegetables and 6-8 varieties of other vegetables should be served In week. If the vegetables specified in the menu are not available, then they may be replaced with other seasonal vegetables available. However it is essential to ensure variety and no vegetable should be repeated twice in a week. 21. Egg must be served from Monday to Friday except Wednesday. 22. Sweet must be served on Saturday. 23. Fruit must be served every day in Dinner except Wednesday. There should be a variety in the fruit served – alternate banana with seasonal fruit. 24. Use of soya granules, peas, chana and other legumes in curries for dinner to improve protein content. 25. Ghee has to be provided during lunch on all days except Sunday. The quantity per child is 2gm. Hence all the Principals of TRE Institutions are hereby instructed to follow the above DIET menu from 01.01.2018 without fail. Any deviation by any Principal in implementation of the above revised DIET Menu will be viewed seriously and disciplinary action shall be initiated against such Principals.